"There are a lot of reasons that I enjoy participating in the Volunteer Lake Monitoring Program. I have always enjoyed both exploring and canoeing. 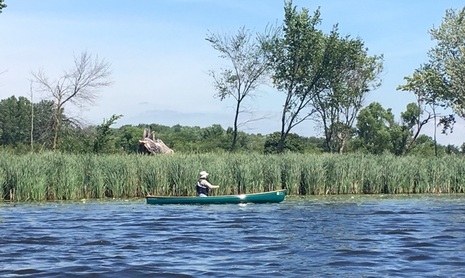 The VLMP provides an opportunity to explore a lake and to learn more about the lake ecology. Each monitoring visit is an adventure, never knowing what you may see or what changes in the lake have occurred. Over the past few years I have learned where the "weed beds" are, when and where the fish spawn, and where the turtles are most likely to sun. I have been able to see how the weather impacts the lake and surrounding area. The VLMP also compliments other land based monitoring programs I volunteer for. As well as being enjoyable, it is rewarding to know that I am providing water quality data that may not otherwise be gathered. I have chosen to make monitoring a little more interesting by tracking the data I collect and looking for trends and changes over time. I like to look into the topography of the lake, the history of the lake, land use around the lake, and watersheds that impact the lake. I feel like I "know" the lake which in turn gives me a feeling of ownership and responsibility for the lake(s) I monitor. Lastly, I have been able to share my enjoyment with my grandchildren." It is not too late to join the VLMP for the 2018 season! If you are interested in joining the VLMP program and monitoring your local lake, please contact the Lake County VLMP Coordinator, Alana Bartolai at abartolai2@lakecountyil.gov or (847) 377-8009. Partnerships and collaborations are a powerful tool for lake management. Learning from the successes and challenges that other lakes face can help lake managers navigate the tricky process of lake management. One local partnership in Lake County is the Tower Lake Drain Watershed Partnership (TLDP). The TLDP was established in 2012 and was developed to help communities in the watershed collaborate on issues and work together to implement best practice projects outlined in the 9 Lakes Watershed Plan. The Tower Lakes Drain includes the Villages of Lake Barrington, Tower Lakes, North Barrington, Port Barrington, Hawthorne Woods and Fox River Grove. Timber Lake, Tower Lakes, Lake Barrington and Lake Fairview are some of the recreational lakes located in the drain. The TLDP provides a forum for lake communities to learn from each and work towards common goals. The TLDP meets on a bi-monthly basis and generally includes outside speakers with expertise in a particular area like shoreline stabilization, water quality, algae control, and fish populations. The TLDP welcomes all area HOAs and lake communities to join the group, even if they are located outside the TLDP. The next meeting will be held on Monday, April 23 at ZaZas Tavola in North Barrington. Social hour begins at 6 PM with meeting beginning at 6:30 PM. Reach out to Steve Burgoon with questions. We need your help to keep an eye out for the Starry Stonewort, a relatively new aquatic invasive species (AIS) being found in the region. Starry Stonewort is a member of the Characeae family which are green algae and not a vascular plant like most aquatic plant species. Starry Stonewort was first found in the Great Lakes region in the 1970's, likely transported via international ballast water and was first found in southeast Wisconsin in 2014. It is currently found in many of the Midwestern states – however, we are still on the lookout in Illinois! Starry Stonewort can occupy a broad range of habitats and occurs in lakes, ponds, and slow-moving water bodies. It can also be tolerant of low light conditions. The impacts of starry stonewort are largely unknown but like most AIS it may out-compete native plants, alter fish spawning habitat and become a navigational nuisance. Identification tips: Starry stonewort looks similar to our native Chara species, however there are a few differences. The primary one is the white star shaped bubil that is located at the "root" end of the plant. 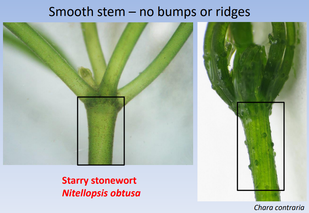 Another key characteristic is that Starry stonewort has a smooth stem compared to Chara which has bumps and ridges. If you suspect Starry Stonewort in your lake, please contact the Lake County Health Department at (847) 377-8020. Join the Lake County Health Department's Ecological Services and the Illinois Lakes Management Association at a Lakes Forum on Friday, April 13th 1:00 – 3:00 PM at the Lake County Permit Center, 500 W. Winchester Road, Libertyville. Come learn about a variety of lake topics including: fish habitat, invasive species, and dredging. Click here for more information. The event is FREE and open to the public however an RSVP is requested. Please RSVP to Alana at abartolai2@lakecountyil.gov or (847) 377-8009. 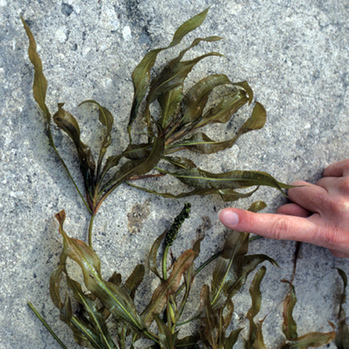 Can You Name This Aquatic Plant?